I thank the Living God for the opportunity to write this book. 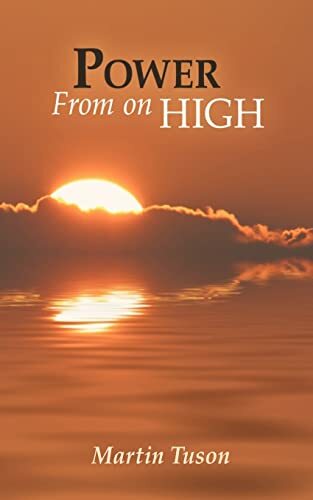 Power From On High follows the first book I wrote a few years ago (Reflection of Christ, Gods power inside the prison cell) Over these past few years I have been a true witness to the miraculous power of our risen Saviour. Throughout Gods precious word, there are many verses which speak about letting His deeds and mighty works be made known. This is why I have written this book. It contains many wonderful testimonies of Gods healing power. It is only but fair that I give individuals a chance to read these wonderful works of the Lord. I have shared much of my own experiences with Gods healing power as well as many testimonies that I have received through the healing prayer and anointed prayer cloths that have been sent all over the world.Really many books could be written, what I have shared in this book is such a small portion of all that I have expereinced. In everything God alone receives all of the Praise, Glory and Honour. He alone is worthy, we serve a mighty and awesome God. His power, love and compassion is still present today. (Malachi Ch3 Vs6). Please be encouraged, every testimony you will read is a true and living testimony.This book is all about the Lord not about me, I beleive Gods power will flow into your own situations in life, whether you are suffering with illness or in any other way. It was on the 7th November 1982 that I put my trust in Christ and was born into his Kingdom. That day the greatest miracle of all took place, the miracle of Salvation. In June 2000 I had an encounter with God when he called me to Prison Ministry, seven years on I stand in complete awe of our God. I will always make his deeds and mighty works known. As I always tell people I am just an ordinary guy who serves an extraordinary God. Praise His Holy name.